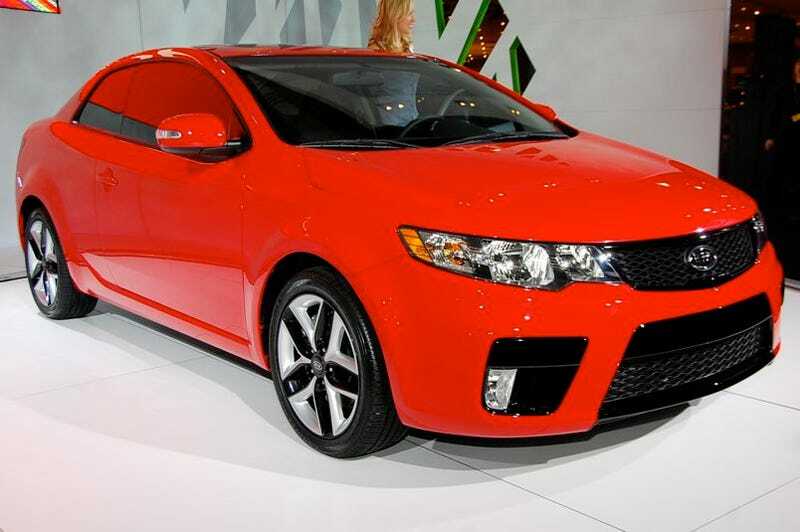 Kia unveiled their 2010 Kia Forte Coupe today and, silly name aside, it looks as sharp as the Kia Koup concept. With an optional 173 HP four-cylinder engine it's clearly aiming for the Scion tC. The new Kia comes standard with the company's 2.0-liter DOHC fourbanger good for 156 HP and 144 lb-ft of torque, which is reasonable by today's standards. Those looking for more can upgarde to the SX and its larger 2.4-liter inline four putting out 173 HP and 168 lb-ft of torque. Either engine comes paired with either a five-speed auto or six-speed manual transmission. With more power on tap than the Focus, non-SS Cobalt, and Civic coupes, Kia is clearly trying to out-muscle the established players. With a clean and modern interior, it's also hoping to outclass them — or is that outklass? Either way, lacking the SYNC system found in the Focus and the name recognition of the Civic we imagine value is going to be the winning component in the Kia Forte Koup calculation. NEW YORK, April 9, 2009 – With performance-inspired, aggressive and sleek styling, Kia Motors America (KMA) today globally debuted the 2010 Forte Koup production vehicle during a press conference at the 2009 New York International Auto Show (NYIAS). Joining the Forte family in the KMA lineup, the company's first-ever two-door coupe embodies the brand's current bold design direction first seen on the concept version of the Soul urban passenger vehicle in 2006. "On the heel of the introductions of the Soul and Forte sedan, Forte Koup represents the next exciting step in the transformation of Kia design and offers a blend of sporty and emotional appeal," said Michael Sprague, vice president, marketing, KMA. "We believe our new design evolution coupled with standard Kia value and safety features will continue to attract customers to the Kia brand." Based on the design styling of the KOUP concept vehicle shown during last year's show, Forte Koup's fluid lines and balanced proportions, meant to evoke an emotional driving experience, closely mirror the powerful design cues of the concept vehicle and offer the same aggressive stance with swept-back wrap-around headlamps, aggressive air intakes and a low, sleek profile. Available in two trim levels (EX and SX), Forte Koup offers a muscular yet sophisticated design. Even from behind, Forte Koup exudes attitude with slim, wrapped tail lights, duel exhaust outlets and a rear diffuser. Like the Forte sedan, two transmission options are available for both 2010 Forte Koup models: a standard five-speed manual transmission or an optional electronically controlled four-speed automatic transmission (EX models). The SX model features a standard six-speed manual transmission and an optional five-speed automatic transmission with Sportmatic®. Progressing to the SX trim offers additional standard touches such as: unique sport cloth seats with vibrant red stitching, a tilt and telescoping steering column, leather-wrapped steering wheel and shift knob, metal pedals and metal finish trim and a Supervision™ gauge cluster with trip computer further enhancing its energetic personality. Both EX and SX trims also offer an optional power moonroof. For inside entertainment while cruising down the road, Forte Koup comes with a standard six-speaker AM/FM/CD/MP3 audio system outfitted with SIRIUS Satellite Radio capabilities with three months complimentary service¹. For added listening convenience steering wheel-mounted audio controls also come standard on all models, as well as USB and auxiliary input jacks in the center console with full iPod® and MP3 controllability via the audio head unit. Standard Bluetooth® connectivity enables hands-free operation for compatible cell phones.